The pioneering rotary brush cutters, now in use for over 30 years in the rugged terrain of Canada’s West Coast. Promac has the right brush cutter for every application. 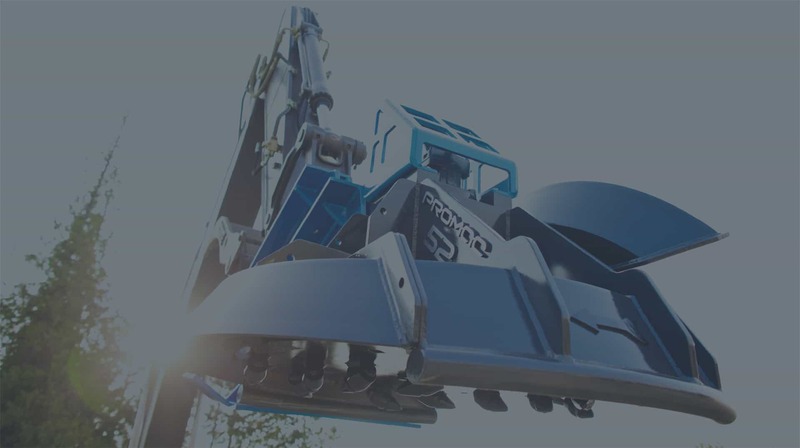 Promac’s rotary disk cutters are the perfect high-production excavator attachment for locations where cutter discharge is not an issue. Promac’s in-house team manufactures each unit to exacting specifications, including tooling, disc, bearing housing, shafts and drive system. We work with customers to match the auxiliary hydraulic flow to attain the desired disk operating speeds. We fully support our customers with quality parts to keep the machines running and our renowned Promac warranty, service and support. Our most popular forestry-rated option. Rotary production with mulcher results. We like dealing with Promac because Matt brings delicious cinnamon buns every once in awhile. We have been working with Promac more and more since we reopened in 2008 and it has contributed greatly to our success. Their service and quality is the best! Promac has a diverse range of shop capabilities that is complemented by a solid engineering team. They provide innovative design solutions and efficiently incorporate available materials and resources in their designs. I highly recommend working with Promac on custom fabrication work. They consistently produce good quality products and deliver on time. I can count on Promac to deliver on-time and on budget. Their sales team offers excellent customer service and is a pleasure to work with.